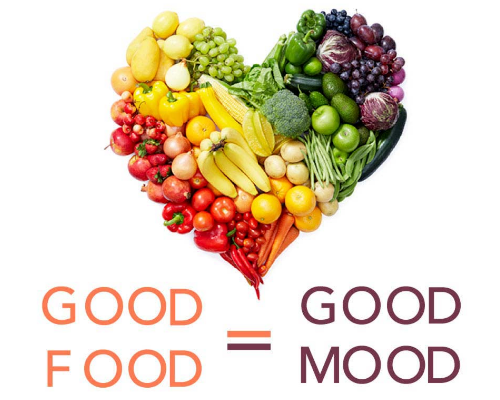 Monthly Topic #22: Do You Fix Your Mood With Food? There's a good reason you might have the urge to scarf an entire tub of ice-cream when you’re feeling down: certain foods can temporarily boost your mood. That's because your body and brain are ruled by a complex group of chemicals and hormones, many of which influence appetite, emotions and energy levels, according to research scientists. Natural fluctuations of these compounds - like those that occur during the week before your period - can make you feel anxious, annoyed or blah. Similarly, when you're upset, say because some loser guy dumps you, those feelings can trigger changes in those same body chemicals. Enter yummy food. Some research shows that certain foods - particularly high-fat goodies such as cheese, ice-cream and chocolate - stimulate your body to produce endorphins, magical mood boosters that give you an instant high. If you're anxious, for instance, you may crave carbs such as bread, potato chips, pasta and soft drinks. These contain ingredients that trigger your brain to release serotonin, which has an uplifting, yet calming effect. High-protein foods, including peanut butter, yoghurt and chicken, do the opposite: they release a chemical that pumps up mental alertness. That may explain why you're more likely to grab a handful of peanuts when you're up studying late at night. As for those cravings many girls get before their periods, there's biology behind those too. During this time, the chemical that regulates your desire for fat surges and levels of happiness-producing serotonin are super-low. Voila! You're suddenly hungrier, and cravings for foods such as chocolates, muffins and biscuits may feel stronger than usual. That's because your body is trying to prepare for a baby, which would need lots of fatty nourishment to grow. Because these foods are so good at lifting your spirits, you get hooked on treating yourself with them. And the very next time you need a pick-me-up, you may crave those self-same snacks. But if you're chowing down when you're not hungry - and eating fattening stuff - you could pack on pounds. Plus, the food makes you feel better only for a short while; once the cake is gone, the problems or bad feelings remain. Of course, there's nothing wrong with an occasional treat if you're feeling blue. Eating only becomes a problem when you "swallow" painful feelings instead of facing them. Answer true or false to the questions, then read on for the scoop on your gut reactions. Fixing feelings with food, unfortunately, is mainly a girl thing. Many of us are taught to smile and not to complain, and we learn not to express negative feelings. Instead, we drown our sorrows in a slice of cheesecake or leftover noodles. The food comforts us, and will never think we're whiners. So how do you break that feeding of frenzy/feelings cycle? If you're upset, before you reach for eats, find a way to vent. Try talking things through with a friend or parent, or try keeping track of your eating patterns in a diary. You may think you're bugging people by spilling your guts, but in fact, confiding in others makes them feel needed. Expressing yourself is like anything else - you get better with practice. Try to label your feelings and be direct. It's also key to tune in to your tummy as well as your mind before you munch. Next time you find yourself marching zombie-like towards the fridge, ask yourself, "Am I really hungry?" Do this out loud, which may knock you out of that snack stupor. If the answer is no (and you've got to be honest! ), there's a good chance something's bugging you, even if it's not at the front of your mind. Try jotting down your feelings in a notebook. Once you start seeing trends in your diary (are you a total sucker for ice-cream at deadline time? ), you can learn to stop eating for the wrong reasons - and find non-food ways to satisfy your emotional needs. Instead of pigging out when cravings hit, try these healthy alternatives to alter your body chemistry and lift your mood even better than food. You might crave: cake, biscuits, muffins Instead, try: working out - with headphones on. Both exercise and music increase levels of the same happy chemicals that these foods trigger. In fact, studies show that 30 minutes or more of moderate exercise, performed three times a week, can actually make people who are mildly depressed feel better. You might crave: chocolate Instead, try: calling a funny friend or inviting your friends over to watch your favorite comedy movie. Just like eating chocolate, laughing releases endorphins, body chemicals which instantly lift our spirits. Curiously, having a good cry on a friend's shoulder can do the trick as well, since sobbing also releases endorphins. You might crave: loads of pasta, noodles, bagels, pretzels, crackers, potato chips Instead, try: taking a warm bath. Carbohydrates like these encourage your brain to release serotonin, which helps to reduce the levels of the chemicals your body produces under stress. A hot soak can work the same magic by encouraging your muscles to relax. Also calming is meditation, which can convert stress hormones into feel-good endorphins. Studies also show that prayer - or just thinking good thoughts for 15 minutes - can reverse levels of stress hormones. You might crave: jelly beans, hard candy, sugary drinks Instead, try: eating an apple, an orange, a banana or some grapes. Experts say that candy and soft drinks that are high in sugar make you tired, since they spark a sharp rise in blood-sugar levels and then make you crash. Fruit also gives you a boost, but the effects last longer thanks to nutrients and fibre, which help keep blood-sugar levels steady.